There are lots of places I've wanted to visit for many years, and I've been lucky to get to many of them. One place that had escaped me was Madagascar. I was very fond of geography as a young kid, and I always wanted to see the world, but Madagascar was a place that fascinated me endlessly, for no real reason. I've spent a little time learning about it here and there, but it never completely captured my attention in part because it seemed so far away, and so difficult to get there. But as I said, I've been able to see many of the destinations I dreamed of, and as I was getting older, it was starting to surprise me that I never made more of an effort to see it. Though, preliminary research shows it's a bit daunting as a vacation spot. It's one of the places where they sometimes still have outbreaks of the plague. Infrastructure is not good, and I'd learn after visiting, some Malagasy people think it's in decline. It's not easy to get there - though more airlines are starting to serve the place. And it's pretty much impossible to drive there as a foreigner. Regardless of all that, I knew it was time to see Madagascar. I did a lot more research and decided we would not be doing this on our own - I'd use a tour company. Even though we are typically very independent travelers (having only used tour companies to hike in Peru, and buy advance train tickets in Asia) in the end, I was very glad to have made this decision, though it meant that our guide was with us almost all the time. That said, I thought the trip length was good; we had about ten days to first do a three-day journey on the Tsiribihina River. Next, we'd see baobabs, including the famous Baobab Alley, and then make our way by land back to the capital. Then we'd do a short tour of the eastern part of the very large country. First, we had to be shuttled from the airport to the start of our river tour, with a night's rest in between. It was a good introduction to the country - an incredibly spare room at a run-down hotel with electricity that cut out periodically. The next day, we went to a large market where we met our minibus. It was just a chaotic lot full of people, market stalls, and vehicles. The roads in Madagascar were torn up with potholes and are more or less destroyed. It was a very rough ride, to say the least. Everyone stopped for breakfast at a roadside restaurant. I wasn't interested in food, but I was happy to see this little dog. This was what the view from the road looked like in the countryside of Madagascar. The place has undergone a lot of deforestation as people have tried to cultivate land, cook food, and build stuff. It's an agrarian society. We saw lots of small family farms, and various livestock, though of course, nothing like a feedlot. Many cows were used to carry plows, for example, and were not meant for food in every instance. We also saw lots of people growing rice, and drying it on the side of the road. It would get run over as trucks and vehicles passed. Madagascar was unlike any other place I've been. There are of course still towns here with modern amenities. We finally arrive at the town where we'd stay overnight before heading to the riverbank. This was the sunset from our little cabin. It was a simple little place; a wooden cabin with a porch and inside, just a bed with a mosquito net and thr most basic but clean bathroom. The stars at night were incredible, and more than made up for our lack of stuff like internet. I was a tad disconcerted though. Our guide, a nice dude named Manda, told us that there was a very small chance that we'd encounter bandits on the river. He had arranged for a guard to join us, but hadn't been able to get in touch with him. He assured us all would be well. But now I would worry a bit. The next morning we got up while it was still dark out and set off. We drove a very bumpy few miles and went to the local neighborhood of shacks where we'd pick up the boatman, a cook, and the guard, who was now in touch, thankfully. We strode down a sandy riverbank and walked about a mile along the shore as the sun rose. It was incredible. I was a million miles from the world I knew. It was finally time to get in the boat and set off down the river. What a strange and exhilarating sensation. They set our luggage and supplies into the boat. Then we got in to what was a hollowed-out tree, fitted with many patches. A few were repaired as we got settled. We were about to go on an incredible journey, one where we'd see quite a lot of birds and happily, have no bad experiences. A few from the inside of the boat, below. The cook made us three meals a day - and two were prepared in the boat! The first day I was stunned to be handed a salad, toast, and fried egg for breakfast.. and it was delicious! The food also stayed great the whole time. In some ways, the landscapes of the river were more or less the same. But I was in awe. We didn't see lots of other people. Of course, there were locals on the riverbanks occasionally, and when we were on the river, we ran into friends of the crew - it was great they traded us some rice for fish, maybe the other way around. And we encountered this group, in the photo below, on another boat. This rude group of French tourists was with another company. I liked their guides just fine, but they shadowed us, our guide said, for their own protection. It was time to take a break. In this case, it would be to see a waterfall. It was lovely. We played around in the water a bit. My husband got in; the water was clear and beautiful and whle the day was hot on the river, the water but a bit too cool for me. After a relaxing break, it was time to get back in the boat and get downriver where we'd spend the night. It was a very small town where people lived without electricity or plumbing in mud or thatch huts. The people were friendly though, and their kids were really curious about us. I was very tired from a long day and fell asleep early in a tent pitched on the ground. 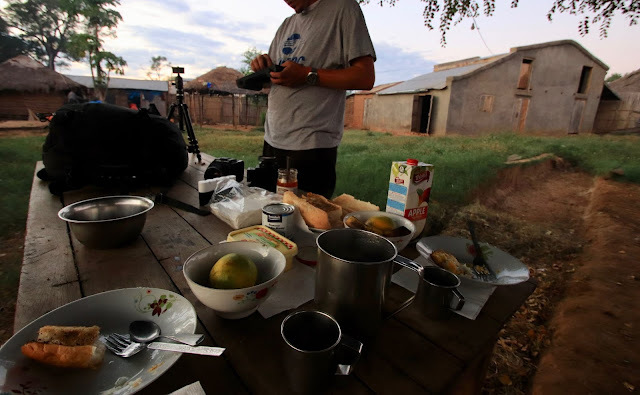 The next part of our journey is chronicled here: Madagascar Part II. We woke up in our tent the next morning, and it was time to get the day started. I don't eat much breakfast, but we were served a nice spread anyway. I stuffed what I could into my mouth, I felt bad for not eating more. Luckily the crew would eat what we didn't so I think they ate pretty well. The town was buzzing this morning, they had gathered to slaughter a cow. I was taking Instax photos of the kids and giving them out, so I was mobbed by a huge group. It was a lot of fun. Check out better photos from this trip, especially the butchery part, at my husband's blog. What a sendoff we got! Then we walked down the muddy banks to our boats, which the crew had already prepared, and climbed back in - next to where the locals were having their morning baths. It was quite an experience, one I will not soon forget. The boat wasn't uncomfortable to travel in for hours, even though we were a bit squeezed into it. I could sit with my legs in front of me, cross-legged, or with them under me. There was a thin cushion in between me and the bottom of the wood boat, and it actually didn't get too wet in there. I am lucky to be normal size and weight, I'm sure it could pose problems for others. A lady in the French group (who had refused to give up a few bucks for the local who let us camp on his land behind a fence) had hurt her ankle and was hobbling around. That would be something I wouldn't want to happen out here; luckily we were fine throughout. Even the bugs weren't that bad. We continued down the river on another lovely day. We were passing through the area where our guide Manda was from. This was an area where some people might face the threat of bandits on the river, but he knew the right people - we would be fine. I'm not sure what to make of what he said; in the end, I'm glad we didn't have that kind of excitement on our trip. The bats in the cave above were one of the wildest things I saw when I was in Madagascar. The above is a crop of the shot I took, shown below, which was the view from the boat. They were amazing. Madagascar doesn't have any large predators, and it's nothing like the treacherous land of Australia. There aren't plants and insects and animals here that can kill people. There was plenty to see on the river. I wasn't bored at all even though our boatman had to spend hours guiding us. We'd find out later that it would take him nearly three times as long to make it back upriver - we were obviously going with the current. While we saw the other tourist boat that had shadowed us the day before, we didn't see many other people the second day. Just a smattering of other tourists and their boat crews. We came to the next place where we'd camp. While there were a handful of folks hanging around to check us out, the majority of the town was probably about two miles away. There were more children here, as friendly as ever. My husband ended up turning over his tablet to them for a while; they sat in a group, mesmerized by WALL-E.
A few adults were around to 'welcome' us as well. This guy just had a chameleon on a stick, but it was a nice gesture - we got some good photos. We had dinner around a campfire, there was some singing and dancing, and then we slept in our tent again. In the morning, it was time to pick up the camp and get going. The villagers had brought in some animal friends to help transport us and our stuff to the village, where there were roads. We would be meeting a 4x4 and a driver there. Until then, we had to get there. Striking scenes in the camp in the morning. We had our breakfast, again a small affair, as other tourists did their thing and the crews got busy. We helped pick up our stuff, and get it all packed so it could be loaded onto the ox carts. Meanwhile, in the other direction, a peaceful scene as mist came off the river in the light of sunrise. Like many other places in Madagascar, there were some cool kids around to survey the scene. The view from the road, below, though unfortunately I didn't manage to get any photos of the traffic jam - when two ox carts going in opposite directions met on a narrow stretch of path, nor all the people, seemingly accompanying us for no real reason. 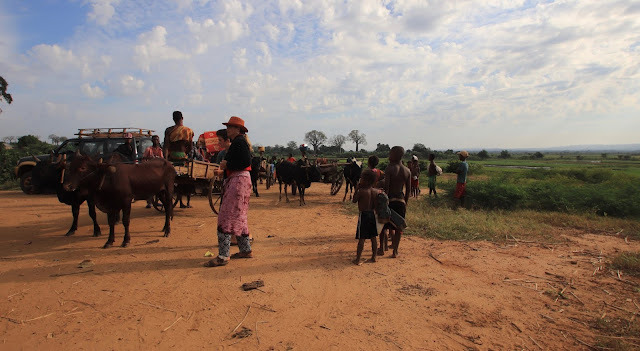 In the end, I disembarked fromthe ox cart and just walked. I was happy with my choice, though I did it barefoot due to the Malagasy mud. We did start to see some baobab trees on this walk though, which was very cool. We got into the village, and I realized it had been a few days since I'd seen any kind of land-based vehicle, which was pretty incredible. We'd also hardly seen any motorized boats - thought admittedly there were a few. It was time to get back on the road and say goodbye to the river. After a short stint in the car, it wasn't long before we came upon another river and quickly learned about how vehicles cross rivers here... it's another amazing affair in Madagascar, a place with very few bridges. In the end, we'd find that it was standard to affix a unch of plywood as a platform to some boats. A boatman would stand at the end of one of those boats at the corner of the platform, and use a motor to drive the thing around once vehicles and people were piled on to capacity - or until he'd been paid enough. Check out the first part of the river tour here.